Jane worked at Lakeview Farms in 1980. Her sister is Tami and her brother is Gary. Jane's married name is Victor. 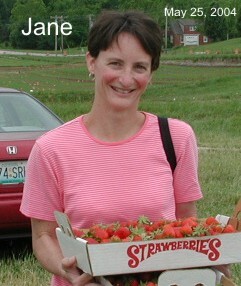 Among all the former teenage employees of Lakeview Farms, Jane turned out to be our most loyal strawberry customers. I can't remember any funny stories about Jane when she worked at Lakeview Farms but I am sure that her dad, Henry, will have plenty. Check back here later.